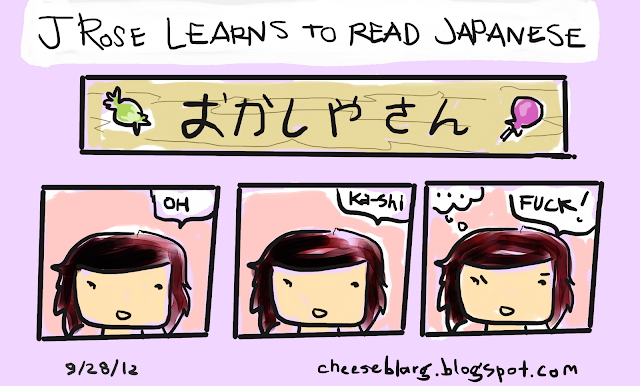 I am learning Kana while hanging out with my friend for my annual birthday trip. Kana, for those of you who are not the sort of person who has all the written languages of the world memorized, is what part of the Japanese written language is called. It breaks down to Hirigana and Katakana, both of which I am currently trying to learn. As usual, I end up sounding like I have Tourrette's while attempting to read out loud. I went to Japan when I was 3. I don't remember much but toys and big silver and glass buildings, and lots of neon. My mother informs me that I threw up in my father's pocket while in a Teppanyaki restaurant, before I freaked out screaming, terrified of knife throwing ninja chefs. I can't be sure that the same wouldn't happen if I manage to get back there, but I would love to go!